Creating mobile applications is challenging, but Microsoft just made it easy for most people to create their own Windows Phone apps. People talk about Indie gaming. The Windows Phone App Studio allows people to create apps to share with their family and friends (as long as they have an App Studio account) using a WYSWYG style web site. Whether you want an app for your kid’s team, an app that introduces your company or an app for an upcoming event the App Studio can allow you to build them on your own with only modest effort and understanding of concepts. So what are the attractive features of the site. The first thing is that you get a preview of what you are working on in most situations. Depending on how much detail you want to put into an app you can have one up and running in ten minutes and be sharing it with your friends. The main features of these apps are that they can display text and media and give users the ability to drill down to the details. Beyond the ability to easily add new pages and data sources, you can also publish the resulting apps to the store and monetize your new creation. This can be done by either downloading the XAP file or the code for you application which then allows you to make further changes via Visual Studio. There are a few things on the “needs improvements” side. The help screens need to be expanded with better explanations of features. For example you can set your data source to either static or dynamic. The help seems to imply that if you set it to static that Microsoft will store your data and download it to your users when it is changed, but that is not said explicitly (my testing proved out this is the case). The data manipulation could also use some efficiency improvements. There should be was to reset the section or page you are in after you start editing. You seem to be able to get into situation where you have no option but to start over. Lastly, I would like to see improved include the ability to use secured RSS feeds and a way to export and import data from the data sources. This development option looks very promising. 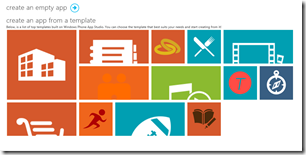 Even while I was writing this post they have added additional templates for apps. The fact that anyone can create one of these applications and share them with anyone else who has an App Studio account makes app development more social. This could make Windows Phone more attractive and accelerate it’s recent growth. Take some time to see for yourself at the App Studio site.